Perhaps it was only a matter of time before Assassin’s Creed got into the battle royale genre, as it the inevitable course for all videogames in this post-PUBG world. Odyssey features its own take on the genre, though it’s not a multiplayer mode – instead, there’s a particular mission that challenges you to be the last person standing against 99 other non-player competitors. The 100-person melee takes place on the island Melos, a level 41 zone that you likely won’t reach until quite late in the game. There, you’ll find a man named Drakios, calling out for competitors in the Battle of One Hundred Hands, which begins a quest called The Great Contender. 100 people are dropped onto an island, and you’ve got to kill them all to become the ultimate winner. It doesn’t have you jumping from an anachronistic airplane, but otherwise it hits all the battle royale notes. You can fight opponents straight-up, or go for a bit of stealth and sneakily dispatch them or snipe them from a distance. As Gamereactor notes, this isn’t part of the main story, so keep an eye out if you don’t want to miss it. If you want to see the whole thing spoiled properly, you can check it all out in the video below. Don’t take this as a hint for the likely return of Assassin’s Creed multiplayer, though. Ubisoft creative chief Serge Hascoet tells Game Informer that battle royale’s success has brought a lot of competitors, and “many will be killed along the way.” Never say never, but it sounds like Ubisoft isn’t chasing this particular trend. 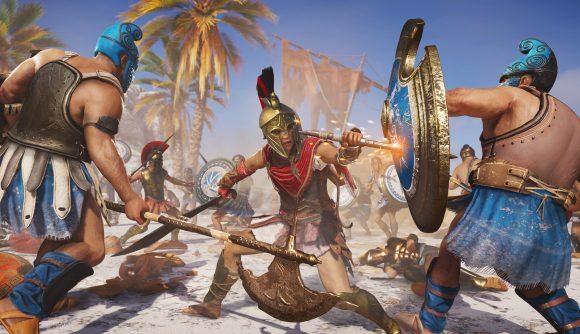 The Assassin’s Creed Odyssey release date is set for this Friday, though you may be already playing early if you picked up one of the pricey special editions. You can follow that link to find out much more about what to expect.